His Excellency, President Al-Assad pointed out during the interview that "today we live in a world that lost its balance. The United Nations is ineffective. Sometimes the United Nations is driven to use or follow double standards. There are supper powers in the world. As far as we are concerned, i.e. small countries, we used to seek the help and support of supper powers in order to establish prosperity and not the other way round. These forces didn't have any colonial experience before the war on Iraq, and that is why I say that wars are results; they are not causes. So we are worried about wrong policies. ", "That is what we are worried about: the wrong policies. We see that things are worsening by the day,"
The president said that "what is destroyed by a war can be rebuilt in months or years, but what is destroyed through wrong policies might need many generations to reconstruct or rebuild. That is how we see it from a comprehensive viewpoint, and not only from a military perspective. It is part of the larger issue." Answering a question on Iraq , President Al-Assad said "the situation as we see it, or as it is seen by other people in other countries in Arab, Middle Eastern or even distant countries outside the Middle East; all these countries agree that the situation is very bad politically, economically, on the humanitarian level and from the other perspectives. That is what we heard from the Iraqis themselves; who have the real problem." The problem started with the occupation and the collapse of the state in Iraq. Regardless of how we look at a country like Iraq, the solution is to reverse this process, by withdrawal (of occupation), and by establishing a state which guarantees stability and prosperity, regardless of how we define this state. So the most important thing is to agree on withdrawal, as a principle, and to set a timetable for withdrawal. Parallel to that, there should be an Iraqi constitution approved by the Iraqi people. This constitution prepares at a later stage for the election of other institutions in the state, like a government, a parliament or other institutions that represent the Iraqi state and people. We should agree on principles and then we should discuss the timetable." The president underlined that "there should be work on building the state with its different institutions. Some people argue that the withdrawal of the American forces will lead to a civil war. This might be true if there were a civil war in Iraq. There was no civil war in Iraq. Iraq was not a nation without state. Previously, it had many problems, and we have our view on these problems, but there was a form of state, and many people disagreed with that state, and we ourselves disagreed with that state. But there is no civil war in order to say that the withdrawal of America and British forces will lead to more turbulence. This is one aspect. On the other hand, it depends on how these forces deal with the Iraqi condition." 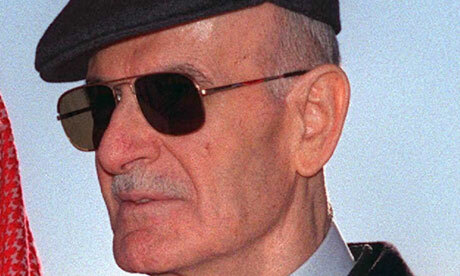 President Al-Assad added that "if the American forces withdraw without allowing the Iraqi people to draw a constitution and to elect their institutions, there would be problems. These occupation forces have responsibilities. The responsibility is to transfer authorities to the Iraqi people, so that they can choose their own future. Then, the withdrawal of these forces will be positive in all respects, for the Iraqi people and the Iraqi state." Answering a question on Syria's position towards the '"Roadmap" (peace plan) and towards the question of peace process in the Middle East, President Al-Assad underlined that "there are initiatives proposed to us using certain terms and that the latest of these was the 'Roadmap'. If you like to draw a map of a certain road, then the road should be there in the first place; otherwise the map will be an illusory one." "This is one of the problems that we suffer from in the Middle East, particularly after the beginning of the peace process. Moving from one illusive initiative to another illusive initiative, causing frustration, obstacles, and difficulties; and these produce further complications and difficulties," the president said. DAMASCUS, Syria, Nov. 30 - Following are the complete remarks by President Bashar al-Assad of Syria from an interview with The New York Times on Sunday. The president's office transcribed and translated the interview, during which the president spoke in Arabic and English. The Times trimmed some text from the questions. Question: May be we can begin with the subject of Syrian-Israeli relations because it has been so long since we have seen any hint of motion in that area; I wonder whether you would like to see the Bush administration take the initiative to try to revive those negotiations. Answer: We don't only desire and wish but we always call, in every meeting and every speech we call on the United States to work hard for the resumption of these negotiations. We also call upon all international parties who are able to contribute to resuming the negotiations to try their best to do so, but I think the role of the United States remains of prime importance in this. We call upon the United States to first have a clear vision for the peace process, second to have the proper means for this process, and third to launch the negotiations. As far as we are concerned in Syria, we are always ready to resume peace negotiations on the basis of Madrid terms of reference. Question: Have you had any indications from the Bush administration that they are trying to? Answer: We spoke with quite few senior American officials about the very point you are raising. Arab and European leaders also raised this issue with American officials. The American response was that "Yes, we agree in principle and this should happen but not now." They said they are now interested in the Palestinian track. All those who are truly interested in the peace process know that peace cannot be achieved unless it is comprehensive. To be clear on that point, we don't see any indication that the United States is ready to launch or resume the peace process on the Syrian track in the near future. Question: Where would you start the negotiations? Given the previous discussions about where the border would go, would you begin again from that point? Answer: Some people mention what you have just mentioned as if Syria doesn't accept anything except this as a starting point. Some people say there are Syrian conditions, and my answer is no, we don't have Syrian conditions. What Syria says is this: Negotiations should be resumed from the point at which they had stopped simply because we have achieved a great deal in these negotiations. If we don't say this, it means we want to go back to point zero in the peace process. This would also mean wasting a lot more time, and every day we waste more people are being killed and more violence erupts in the region. Apart from that, when we say that we have agreed on80 % of the points of the peace process -the details of the points agreed upon are of course with the American administration; I mean if we go back to point zero, we might even not agree on the points on which we had agreed in the past not because we have changed our position in Syria but because changes have taken place in Israel. That's why we say we would like to resume negotiations from the point at which they had stopped in order to reach the best results in the shortest possible time. Question: There have been rumors from time to time that Syria has been sending envoys; there was a story that your brother went to Jordan to meet an Israeli official just to explore the possibility of resuming negotiations. Is there any truth to any of these rumors? Answer: My brother is not involved in politics, and he never traveled to Jordan. Question: But the larger question is whether there have been any exploratory meetings between Syria and Israel about resuming negotiations? Answer: No. We look for indications through mediators. 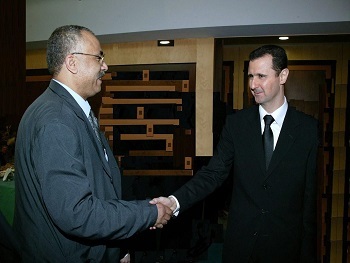 Those mediators are friends of Syria, Arabs and foreigners. But we look for these indications from the United States and not from Israel, because as I have said we in Syria believe that if the United States doesn't have the vision and the will to make peace in the Middle East, everything else will lose its value and there is going to be no peace. Add to this the fact that there are very clear signals from Israel against peace at this moment of time. I'm speaking in particular about the period since Sharon assumed office in Israel. Question: Do you see the beginning of a vision on the part of the Bush administration? Answer: Let's take two sides of this vision. We agree with what you said regarding a two-state solution and getting rid of settlements; these are correct principles. These are the beginnings but they remain as principles. This has to be complemented by putting mechanisms to achieve that; you cannot just keep talking about this vision, you have to put a mechanism in order to achieve that vision. Any country in the world, including those who have no influence in the region, can speak about a general vision but not the United States. The United States has the means and tools to implement a vision, it's an influential country. Regarding the US demands from Syria and whether she is ready to discuss the exchange of interest in Iraq so that a cooperation with the Americans can be made, President Bashar Al-Assad said the US demands are usually unidentified and are sometimes contradictory. He said "For example, they call for giving up mass destruction weapons and when we call for giving up those weapons from the whole region, they object. The US demands are many and what is important for us is whether these demands fit or unfit our interests. The Americans demanded the expelling of Palestinian organizations leaders, but they are only officials. The leaders of the organizations such as Hamas and Islamic Jihad are inside the occupied territories, we rejected this demand because those officials did not violate the Syrian laws, did not encroach upon Syria's interests and are not terrorists." 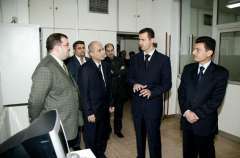 Asked about the non-compatibility of the US accusations as regards Iraq, especially the allegation that some resistance men fighting the US occupation troops come from Syria and neighboring states, Al-Assad said: "Under normal conditions and when there are no problems, the smuggling of persons or goods are frequent. But the insecure conditions where a war, occupation and disorder exist, it is natural that conditions deteriorate. President Bush talked to the Focus channel a time ago and said Syria was doing its duty but the Iraqi borders are vast". 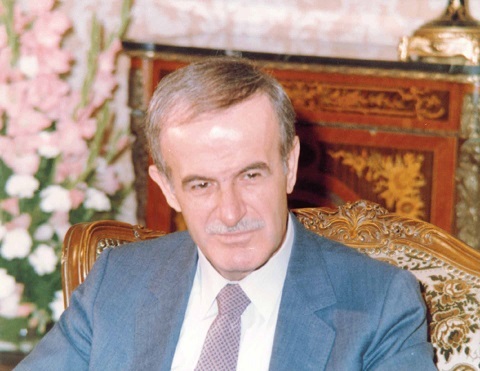 Al-Assad added "There is a difference between actions carried out with the knowledge of the state and actions beyond its control. The borders are long and uncontrollable. "Concerning neighboring countries, there is a state of complete disorder where arms trafficking and fleeing of persons are frequent. The Americans say they are terrorists. For the Americans, any Arab is a terrorist. However, the question is how to prevent such illegal actions with joint cooperation if the situation remains as it is." Asked if he approves the US proposal to change Iraq into a main battlefield against international terrorism and whether this poses direct danger against Syria and her neighbors, President Al-Assad said "There is a contradiction in the US proposal. There was terrorism in Afghanistan and the Americans were not there. They came under the pretext of combating terrorism but so far they have combated nothing. They later attacked Iraq before combating terrorism and when they were inside Iraq, they say that some terrorists crossed Iraq may there is terrorism. Moreover, the battlefield of terrorism needs a society which is fertile ground for terrorism. The Iraqi society is not prepared for terrorism and was never known as terrorist. The saying be correct as terrorists exist in all world states. The US and Europe are full of terrorists, but does this mean that the two regions are venues of terrorism." Asked about Syria's readiness to cooperate in helping to rid the existence of terrorist elements in Iraq, the President said "Terrorism has no identity and such vision has been ours since the 1980s. This vision has been firm for any one who talks bout terrorism combating. Now in Iraq, there is neither a state nor an authority and hence with whom do we have to cooperate." His Excellency, President Bashar Al-Assad said the recent summit in Aqaba was designed for the Palestinian track. Syria was not invited to the summit and that Washington postponed talks on the Syrian-Lebanese tracks. President Bashar said Syria announced she agrees to what the Palestinians agree adding "Frankly speaking what we heard from the Palestinians whether before or after the war on Iraq was a refusal of what is called the Roadmap plan. We have many remarks on this plan, but eventually we will agree on what the Palestinians decide and agree.'' The President also said "Syria has adopted the cause of Palestine according to the liking of its owners ( i.e the Palestinian people). We cannot refuse anything they are convinced of. When we participated in the 1991 Middle East peace process, we thought that this track would lead to one Syrian-Lebanese-Palestinian track. But what we had taken place was the fact that the Oslo process had actually separated the Palestinian track from the other two trails which remained one track. 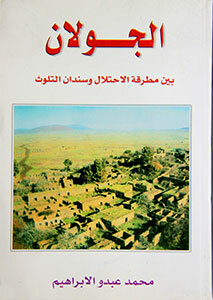 "After the outbreak of the Intifada, however, many people realized that what Syria was saying is right. Then the Palestinian presentation was introduced in a different formula from what was being said previous to the Intifada. 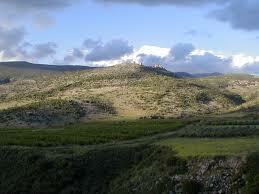 Thus, Syria was able to present the same view it was convinced of. This enables us to say that the Syrian presentation is in agreement today with the convictions of the Palestinian citizen When we say this land is occupied, in our view and convictions and accordance with what the international resolutions say, it means that this land is occupied and the rightful owners of this land have the right to defend it and resist. Historically, this right has been sacred. There are many examples in history, first and foremost the resistance which was led by Charles de Gaulle during the World War II." Interviewer: Mr. President, for us Syria's position on the liberation war of Iraq wasn't different from its previous position, but what happened in the liberation of Iraq is something that Kuwait has nothing to do with. There were things imposed on us, and it was important for us to get rid of Saddam. As you, in Syria have suffered from him, we too have suffered more; so why is this Syrian position? 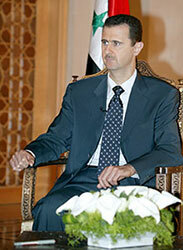 President Al-Assad: Let's consider the current Syrian position. It is very important to compare it with the Syrian position during the Iraqi occupation of Kuwait. There is an aspect that has to do with principles and another aspect that has to do with interests; which is natural as countries deal with each other through principles and interests. In principle, our public position as Arab countries has always been that we are against any kind of occupation. Even in the recent meeting of the countries neighboring Iraq that was held in Riyadh, the statement made was for the withdrawal of foreign forces from Iraq in addition to preserving its unity and territorial integrity. The other point is that when Kuwait was invaded by Iraq we believed that it was going to lead the entire region into turbulence that would persist for a long time. Therefore, our position today, regardless of Saddam, is that the occupation of Iraq is unacceptable. We can't say that Iraq is Saddam. There is a problem. We Syrians in particular no longer talk about Saddam and the regime because we already demonstrated credibility on this subject in the past. I mean that the entire Arab world knows the Syrian-Iraqi disagreement; so there is no need to say that we were against Saddam. We differed with him for a very long time. Saddam's support for turbulences that occurred at a certain stage in Syria is very well known. But we always wanted to exceed this to the future. So, we all agreed, for example, that we wanted this regime and this President to go, but what about Iraq? We didn't discuss the issue of Iraq. As a matter of principle, we stood against the occupation of Iraq as we would stand against the occupation of any Arab country. Moreover, and regardless of being an Arab country, we are a neighboring country of Iraq and the war will have direct effects on us, as well as on all the other countries neighboring Iraq. So, taking the Syrian interest into consideration, it is only natural for us to be against the war whose effects we are witnessing now. The third point is that targeting Syria has preceded the war, and this is why we knew that there will be threats after the war. When we looked at the situation before the war we saw the future that we are living today. So it is logical for us to be against the war. We distinguished between two things: First, the Syrian position on the regime and the Syrian position on Iraq; and this should be always clear with regard to the Syrian position and the position of all Arab countries. Second, our position on Iraq and our position on Kuwait; and this is one of the points that were raised recently. In this regard, I think that Kuwait has to negate this before Syria does. There is no connection whatsoever between being against the war and being against Kuwait, that is the former does not imply the latter. To the contrary, the subject is completely different. The two issues are separate. We might differ with Kuwait, as we might differ with any Arab country, on a certain subject and might agree on another, but this has nothing to do with our position with regard to Iraq. Interviewer: The visit of Skeikh Sabah Al Ahmad was on the basis that the Syrian position was not against Kuwait, and when Sheikh Sabah Al Ahmad gives a statement that any threat to Syria is a threat to Kuwait, this is a clear Kuwaiti position, especially when others say that Kuwait has no sovereignty. We think that this is a position that others have never expressed while the Americans are on our land. What is your point of view with regard to this subject? President Al-Assad: Not all that is said is an official position; this is a point that I want to stress. If we want to speak about sovereignty, it is relative in this world, especially in the absence of international balance. In fact, even the sovereignty of big countries is relative ذ we are all aware of this international situation. So speaking about sovereignty is relative. With regard to the visit of Sheikh Sabah al Ahmad, it was important in terms of timing and content. Both before and during the visit, Sheikh Sabah Al Ahmad expressed a very clear Kuwaiti official position. 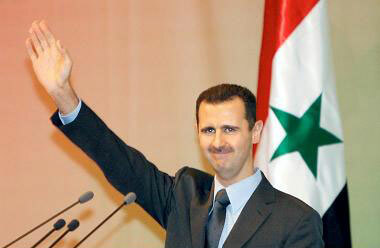 He rejected the threats against Syria and said that Syria and Kuwait are two Arab countries after all. We are Arabs, and we are human beings, and sometimes in one household a man might differ with his brother over some household issue. This doesn't mean that we should pay compliments to each other when we have a clear point of view on a certain subject. Within this frame, came the visit of Sheikh Sabah Al Ahmad, and his position was quite clear. Today there is a new situation in the region. There are stages at which we might differ but we have soon to look for points of mutual interest. Otherwise, if we differ all the time what will the result be? It won't be positive!